Manufacturers also raising recruitment levels, according to HSBC report. 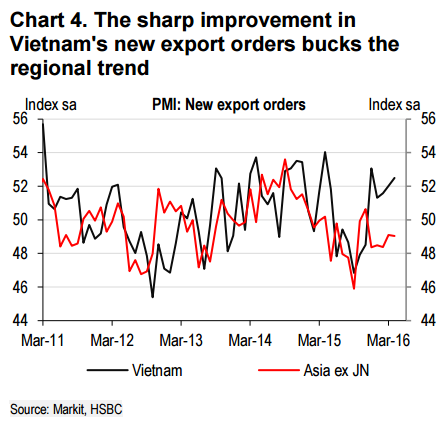 The strong results in the April Purchasing Managers’ Index (PMI) point to a rebound in the second quarter of 2016 and HSBC believes output will continue to rise in the months ahead, its Vietnam At Glance report, released on May 4, stated. 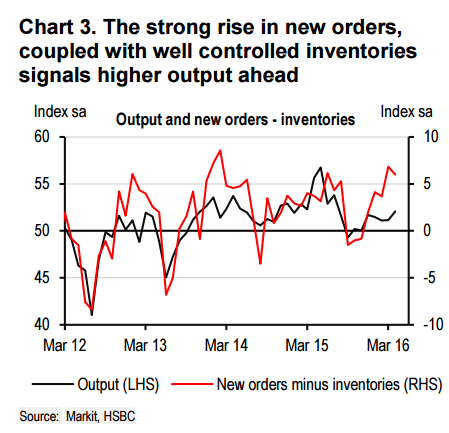 “Our leading indicator - new orders minus inventories - eased slightly in April but remains at very high levels (Chart 3),” the bank assessed. Manufacturers have also been ramping up headcounts, with the employment index jumping to an eleven-month high, reflecting confidence in business outlook. Total disbursed FDI was up at? $3.5 billion as at March, marking a 15 per cent year-to-date increase year-on-year. “With new factories commencing operations, output has continued to rise despite sluggish external demand, driving the continued outperformance of Vietnam’s manufacturing sector vis-à-vis its neighbors (Chart 4),” according to the report. Export growth improved to 6 per cent year-to-date year-on-year in April, up from 4.1 per cent in March. ‘‘This is weaker than the growth rates recorded during the same period last year but sequential momentum has been improving,” the bank evaluated. Additionally, shipments of smartphones (phones and spare parts) continued to be the driver, rising 25 per cent year-to-date year-on-year in April against 13.6 per cent during the same period last year. “The strong growth in the first quarter of 2016 was partly buoyed by new product launches by Samsung (Vietnam’s biggest foreign investor) but whereas manufacturing momentum has fizzled in the rest of the region the recovery in Vietnam looks to be more sustainable as it is driven by new FDI coming online,” the report stated. HSBC expects FDI to drive recovery in export growth to 10.1 per cent year-on-year in 2016, up from 7.9 per cent in 2015. The resilience of the manufacturing sector should help support growth against a backdrop of deteriorating activity in the primary sector due to the effects of the El Nino weather pattern, the report concluded.